How can museum exhibits foster empathy? This is a long overdue post of our session for the Association of Children’s Museums (ACM) Interactivity conference this last year. It’s a topic that is increasingly relevant in a polarized country (and world), where studies show an alarming decline in empathy the last three decades (the “empathy deficit”), and increases in stress and isolation. How can museums respond proactively to the decline in empathy? 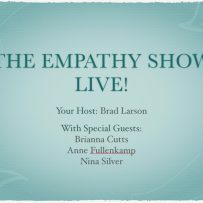 Despite the gravity (or maybe because of it) we decided to play it up and do the session in a talk show format — The Empathy Show! — complete with opening music on entering the room, applause signs, and audience participation. I was the talk show host, and was joined by guests Brianna Cutts from The Sibbett Group, Anne Fullenkamp from Children’s Museum of Pittsburgh, and Nina Silver from Skirball Cultural Center. We had fun. Brianna Cutts opened the session with an overview, including both theory and practice. I’ve appreciated Brianna’s insights on the design process for a while now, including her presentation on the design process at AAM a couple years ago, and her work with a range of organizations, including global design company IDEO and museums around the country. The point she made that sticks out in my mind these many months later: “empathy” is challenging to design for…but “curiosity” may be a more achievable starting point — an “inquisitive interest in others’ concerns”. You can find the PDF of the slides in her session here. Anne Fullenkamp, Director of Design at Children’s Museum of Pittsburgh followed, and talked about their groundbreaking exhibit: “XOXO: An Exhibit about Love and Forgiveness.” Anne showed examples of ways they designed for empathy and reflection in the space: text about love and compassion on a mirrored wall so you see yourself and family as you read the text, an interactive that requires holding hands together to light a panel, and more. You can find a variety of great examples from her presentation here. (As an aside, the Museum is continuing to chart new ground on social emotional learning — maybe not surprising in that it has drawn inspiration and advice from the work of beloved local children’s television pioneer Fred Rogers). And Nina Silver, Head of Noah’s Ark, an exhibit at Skirball Cultural Center that has earned admiration internationally for its artistry and socially-connected impact, described ways they build “empathy in action” into the exhibit and programs. Metaphor, puppetry, and theater are all put in service of programs, including welcoming refugees at the San Fernando Valley Refugee Children Center, and practicing stewardship of our environment. Noah’s Ark reaches out to work with community partners (another important component) to encourage discussion and action toward making a better world. You can find Nina’s examples here. And, since we decided to do this as a talk show, I thought it fitting that we broadcast the session live, which we did via YouTube Live using techniques from the Museumhive project I did with NEMA. It was a big experiment, the first time something like this has been done at the conference. It wasn’t perfect — the laptop conked out halfway through, I jiggled some cables and then the projector went down temporarily — but I think it’s a format that served the topic well. 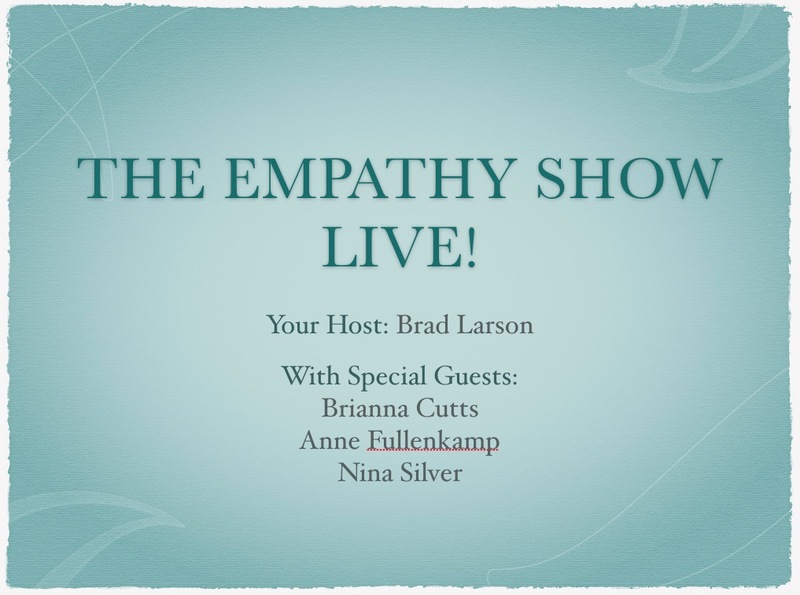 You can see the archived version of The Empathy Show! below (at least the first twelve minutes before the laptop gave out). We’ll likely submit a proposal to revive the show at a future conference, focusing on new initiates that foster empathy in museum programs and environments. soliciting applause for The Empathy Show!